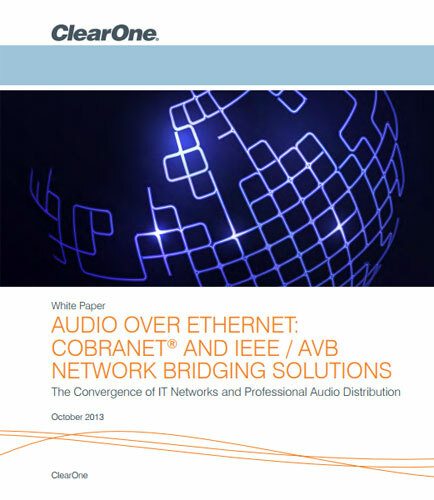 "Audio Over Ethernet: The New Vehicle for Audio Transport"
Audio over Ethernet offers substantial potential cost savings in cabling and other infrastructure. With the convergence of IT systems and professional audio technologies, high fidelity, low-latency, digital audio can be efficiently distributed over Ethernet using one of many available protocols. As these technologies have evolved and the domains of sound transmission and information technology have converged, the transition from analog cabling into complex digital network infrastructures has not been without its challenges. Describes some of these innovations, including the emergence of Audio over Ethernet, CobraNet1, IEEE Audio Video Bridging (AVB), and other industry standards.